CCH's annual Hong Kong Master Tax Guide is well-known as the preeminent handbook in the field, with detailed guidance and in-depth analysis of Hong Kong tax law. The 2012/13 Hong Kong Master Tax Guide not only explains all recent tax changes and their implications, but also continues its hallmark analysis of the underlying tax law, from basic legislation to court cases and the latest Departmental Interpretation and Practice Notes. This 2012/13 Hong Kong Master Tax Guide highlights legislative changes since the last edition, budgetary amendments, new and revised Departmental Interpretation and Practice Notes, tax-related Board of Review and court cases. Expert review by the professionals at Deloitte Touche Tohmatsu clarifies the practical implications of all recent changes in the light of the underlying law. For more than twenty years the Hong Kong Master Tax Guide has served the information and guidance needs of everyone doing business in Hong Kong. It has proven itself over the years to be of inestimable value to practitioners, other tax professionals and students. 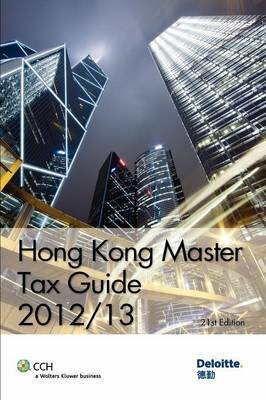 The 2012/13 Hong Kong Master Tax Guide is published by CCH, the world's leading publisher of guides to tax regimes including the US, UK, China, Canada, Australia, Singapore, Macao and Malaysia.